Earrings are fashion accessories that reveal one’s personality, style and panache. Available in different types, check out a few kinds of earrings by browsing through this article. Earrings have been an important part of jewelry since times immemorial. Apart from being just a piece of decorative jewelry for the ear lobes, earrings represent style, flair, and the way a person portrays himself. While traditionally earrings were meant for women, these days, men too can be seen flaunting different kinds of earrings. Considered to be one of the most essential part of a person’s jewelry, earrings are available in various types to suit the needs and desires of a wearer. An earring can make a person reflect a different look. For this reason, earrings are found in different types categorized on the basis of shapes, sizes and styles. Given here is a list of some types of earrings. Read to discover them. Stud earrings are an everyday jewelry worn by both men and women. They float on the ear or earlobe without a visible point of connection, thereby setting a distinguishing characteristic from the other earring types. They have a post at the end, which penetrates straight through the ear piercing and is held by a removable friction back or clutch. In some cases, stud earrings have a screw at the back that secures the earring in place. This helps in preventing expensive earrings from being dropped or misplaced. Commonly known as ‘baali’ or ‘baliyan’ in Hindi, hoop earnings are circular or semi-circular in design, similar to a ring. They generally have metal tubing with a thin wire attachment at the end, which penetrates straight through the ear. This tubing is hollow and is permanently attached to the wire at the front of the earring, while the back is open, allowing the wire to pass through the ear and securing it in place back into the tube. Dangle earrings, also known as ‘jhumka’ in Hindi, pass through the ear piercing and flow down from the earlobes. Available in various lengths, ranging from 1 cm to shoulder length, dangles are attached to thin wires that pass through the ear to be connected with a small hook at the back. French hooks are a variation of dangles, which hang from the ear, without any closure at the back, though small plastic retainers are sometimes used at the ends. Slave earrings are commonly worn by Indian women on formal occasions, such as weddings. In such a type of earring, the stud is connected with a delicate chain to the ear cuff or a cartilage piece worn higher on the ear. Slave earrings are often worn to support heavy dangle earrings and divide their weight. Amongst the non-pierced earrings, clip-on earrings are the oldest and most popular. They have a tension clip, which secures the earring to the ear by pinching it into the earlobe. Clip-on earrings were highly popular in America, but their popularity started declining with the coming of pierced earrings in the 1960s and 1970s. Nonetheless, clip-on earrings are again gaining recognition these days, though their prominence is quite rare. Magnetic earrings are extremely popular amongst people who do not have pierced ears. 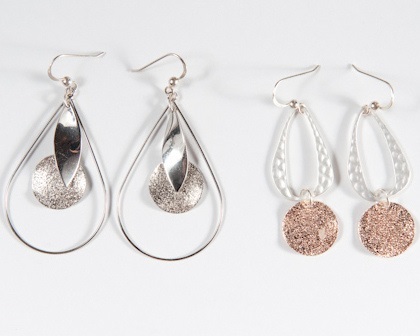 The earrings are held in place by attaching the earring to the earlobe with a magnetic back, through magnetic force. It is due to this magnetic force that these earrings stay in place, thereby resembling pierced studs. Stick-on earrings are a novelty item highly popular amongst kids and teenagers. They have adhesive backs that are stuck to the earlobe, giving the appearance of a pierced stud earring.